Wholesome food always makes you feel good; it’s made from humble ingredients and is full of good things like beans, vegetables and whole grains. 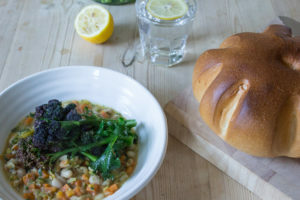 I normally eat slow cooked, what I would describe as wholesome, meals in the autumn and winter but this easy white bean stew with purple sprouting broccoli is the perfect dish for this time of year. It’s quick and easy to make, is full of seasonal vegetables and is absolutely delicious. Using seasonal veg not only makes the best of what’s around but means it’s super cheap to cook up too, feeding four people for around £4.50 (most of what I used was organic too!). Get a casserole pan on a medium heat and add a little oil. Stir the garlic in and stir briefly before adding the carrots, leek and bay leaves. Add a dash of water (2-3 tbsp is all) then leave everything to soften for around 10 minutes. Add the beans and stock and then simmer everything for 10-15 minutes with a lid half on. Fill a pan with a steamer with a little water then get it on to boil. Check the stew, it should be like a thick soup, you can add a little water if you need to thin it out then season with salt and pepper. Remove from the heat and keep warm. Stir through the parsley. When the water is boiling steam the broccoli for 2 minutes then remove and squeeze over the juice from the lemon and a good grinding of black pepper. This is one of my favourite dishes and one that I can see myself returning to again and again. It’s also vegan, which I realised afterwards so if you’re looking to expand your vegan cooking repertoire then I can recommend this as an excellent place to start! 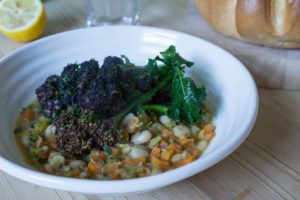 It’s lovely to have the seasonal purple sprouting broccoli as the star of the dish and the acidity the lemon brings cuts through the comfort of the bean stew. I also normally have some sort of white bean in my cupboards and I think it would work with any of them. If you make double the amount it’s also very tasty served as a soup the next day. I would advise serving this with crusty bread so you have something to mop up the juices from the stew. I have never seen purple broccoli over here…the stew looks very tasty and satisfying. 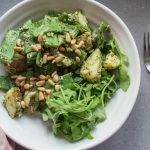 This is a nice, quick, healthy, filling dish! Loads of flavor and goodness — my kind of food. Thanks. So I’ve seen purple broccoli at the store just once or twice, but I’ve never tried it. I need to grab some next time I see it. 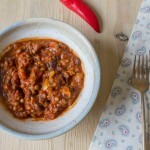 Love this recipe…quick, easy and tasty! What a lovely wholesome dish for spring! 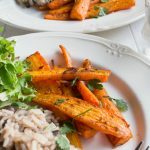 I am a big fan of white beans and this looks delicious! Hi Caroline, I always have dried and canned white beans in my pantry. Love, love this dish, looks delicious. We can also find orange and lime green broccoli at the farmers market. The purple is my favorite. Such a comforting soup! I need to try purple sprouting broccoli. I’ve seen it recently in the market. Purple broccoli is something new to me. And this stew looks so awesome wit loads of flavors and textures. That purple broccoli is gorgeous! And what a lovely meatless meal! I’m loving wholesome food lately as well! This looks amazing.